Hi guys and Happy Easter! 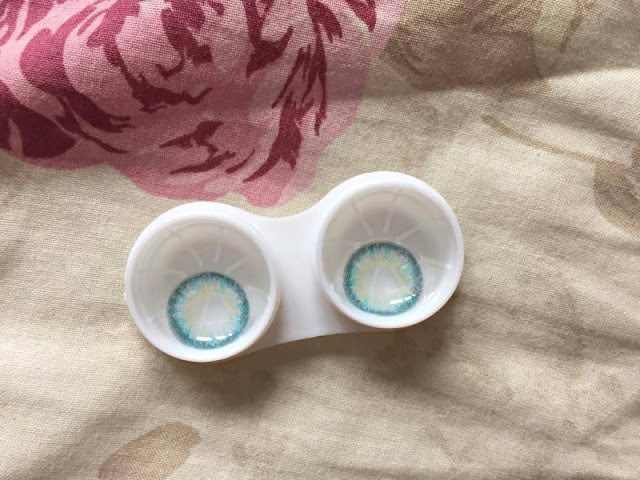 I hope you're having a wonderful day with your beloved ones and tons of chocolate :D today I have a new circle lens review for Uniqso, I chose the Eos Pastel Blue, a gorgeous natural blue pair! As always I had no problems with Fedex shipping :D I really recommend it because it's super fast and avoids the customs! Eos lenses now comes in these packages really easy to open, say goodbye to the old glass tiny bottles ahah! As you can see the lenses cover really well my brown eyes, the tiny yellow tint inside blends perfectly blue color with the brown, they look so natural in real life too! I love the fact the color is really visible but at the same time natural, they totally look like my real color especially in real life :D I can't be happier! The diameter is big but the final result is really natural, I think this pair is great both for daily life and events. They come with prescription as well and you can get them here.